The Colorado Rockies have shown a willingness to spend big over the past couple of seasons, and they’ve done it again. On Wednesday, the Rockies announced that they have signed center fielder Charlie Blackmon to an extension. The deal has four guaranteed years, starting this season. It also includes two player options that could keep Blackmon in Colorado through the 2023 season. If Blackmon ends up staying all six years, he will make at least $108 million. With incentives, he could make as much as $116 million. Rather than trying his luck on what was a rather frigid market last winter, Blackmon will make $14 million in 2018 and $21 million per season in each of the next three years. He will then have a $20 million player option for the 2022 season and a $10 million option for 2023. The 31-year old Blackmon has become one of Colorado’s most important players over the last few years. He is a two-time all-star who has also won the Silver Slugger Award each of the last two seasons. Blackmon also won the National League batting title in 2017, hitting .331 on top his his 37 home runs and 1.000 OPS. Perhaps more impressive was Blackmon’s 103 RBIs while hitting out of the lead-off spot. 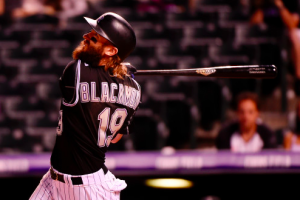 With his performance the last two seasons, Blackmon has asserted himself as one of the top outfielders in baseball and an essential part of Colorado’s future. He was a key part of the Rockies reaching the postseason last year. He will continue to be a cornerstone for the club. With star position players like Blackmon and Nolan Arenado, as well as a young and promising pitching staff, the Rockies hope to be World Series contenders in the years to come. From Blackmon’s perspective, it’s hard to turn down a nine-figure contract in a place that’s been good to him. Aside from a potentially tepid free agent market next winter, teams would have questioned his home-road splits. Naturally, Blackmon has been ore produtive at Coors Field than on the road throughout his career. But his road numbers the past couple of seasons have been solid. Obviously, that won’t be an issue as long as he stays in Colorado. Of course, the Rockies may need to worry about Blackmon’s age. If he plays to the end of the contract, Blackmon will be 37. Most teams are making more of an effort to get younger and avoid long-term deals with players who are already 30. Despite his impressive numbers over the past couple of seasons, there is some risk in signing Blackon to a long-term deal at this point. Despite some risk involved, the Rockies are wise to lock up Blackmon long term. Last season’s success showed that their window to pursue a championship is open. Thus, they need to keep a star like Blackmon in Colorado while the window is open. At this point, Blackmon is too important to the Rockies for the team to let him go in free agnecy. In that sense, both sides should be pleased with the extension.